If the season ends today the Anaheim Ducks choose 8th overall at the upcoming draft in June and, depending on the rest of the season, could even end up with a chance at moving up four spots at the draft lottery in April. (Photo by Herman Von Petri). Obviously their ranking can change for the better, with eleven games remaining in the season, but this somewhat shocking statistic really puts this Ducks season into perspective. For fans who are on a temporary high from witnessing some overall improvement in the team’s play as of late, seeing something like this should unfortunately bring them back to reality. The Ducks goaltending has been impressive, their defence has tightened up, and the players seem to be relishing in a fresh start with new coach Bruce Boudreau. These are all positive things, but it’s too little, too late when it comes to how the team performs for the remainder of the year. The real silver lining to this underwhelming season is that the fans are getting a glimpse at what the future holds for the Ducks, and it seems to look pretty bright. Here are some things that Ducks fans should be looking forward to for the immediate future and further down the road. Other than Selanne, for various reasons, I have not included anyone that has substantially contributed to this season. The native of Smithtown, New York has been the best call-up for the Ducks this year. He has registered three goals and one assist in thirteen games played, which is the most points in the least amount of games out of every recalled player this season. He also has the best plus/minus out of that group. “I think I have to keep him a little longer. He brings good karma here. His confidence continues to grow, his speed is impressive, and he has an underrated shot. He could fit as a top-six scorer or a bottom-six checker, and it seems to be up to him which role he plays as he is capable of doing both. Going forward it looks as though Palmieri should make quite the case for himself in hopes of a permanent roster spot next year, and so far it seems like his presence would benefit the Ducks nicely. Hailing from Caledon, Ontario, the Ducks’ first round pick in 2009 has shown in the past couple of years that his all-around game is coming together. Holland is a pretty big centre, which is always a hot commodity, but he has shown in the past to be a little soft, and lacking in grit. Scouts saw him as a player with huge talent, but without the know-how and consistency to use it to his advantage. After a couple of exceptional seasons with the Guelph Storm, and with 49 points in 58 games this year as a member of the Syracuse Crunch, he is becoming very attractive as a call-up next year. With the current Ducks roster getting up there in age, and the way this season has gone, I wouldn’t rule out a permanent spot on this team in the near future for Peter Holland. What is more exciting than a kid getting drafted by his hometown team? Born in Long Beach, California, and drafted 29th overall in 2010 by Anaheim, Emerson recently became the first WHL player in 11 years to score 51 goals in 50 games. Etem is likely to spend time developing for a while yet, but his exceptional speed, and consistently impressive defensive game are undeniable assets that he already posesses. He is showing some off-the-charts potential as a top six forward, and a premier penalty killer, for the Ducks in the future. In the draft he unexpectedly dropped from a projected top ten pick to 29th overall but, with this season’s play, he is doing the exact opposite. Emerson Etem is not exactly something to look forward to in terms of helping the team turn things around right away, but he has undoubtedly been one of the most exciting sparks to this season for the Ducks organization. 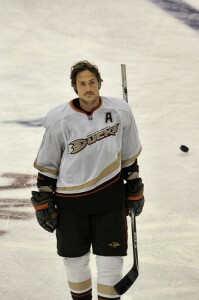 Though signing on for another year may be unlikely given this seasons outcome, Teemu Selanne has once again shown virtually no signs of aging. He is currently leading the team in scoring with 60 points, and he is averaging 18 minutes a game. That he still contributes so much to this team at 41 years-old is incredible, and the hockey world may be witnessing arguably the best twilight years ever played. Is it improbable that the illustrious Finnish Flash will take one more crack at the whip? Yes. Is it completely out of the question? Not at all. There are other bright spots in what has been a pretty dark season, but these are the brightest and most exciting. Time will tell if any of them will adequetly contribute to the campaign to end Duck hunting season for good.